Summer is here and you probably have unused vacation time waiting. Are you unsure of a destination that the whole family will enjoy? Our team put together a list of six of our favorite vacation destinations in the U.S. with something for the kids, as well as mom and dad. No matter everyone’s interests and the budget, you’re sure to find something enjoyable on this list. Few places beat the natural beauty of the Pacific Northwest. Sunset Bay State Park offers camping experiences that feel private, without interruption from others. Moreover, Sunset Bay offers camping in yurts, domed-structures that are a cross between a tent and teepee and sleep up to five people. Each yurt campground offers plenty of room for the kids to run around and explore, and nearby ocean tide pools make for good whale watching, exploring and swimming opportunities. For older kids, the four-mile Oregon Coast Trail winds along the beach up to nearby Cape Arago State Park, just right for a great day-hike. Yurts should be reserved in advance through recreation.gov. There are no dining options at the park, so be sure to stop by a supermarket in nearby Charleston or Coos Bay. Yurt stays are $36 per night during the peak summer season. This is much cheaper than renting motel rooms in the region, which run closer to $100 per night. We move down to the opposite end of the West Coast to southern California and this popular destination. 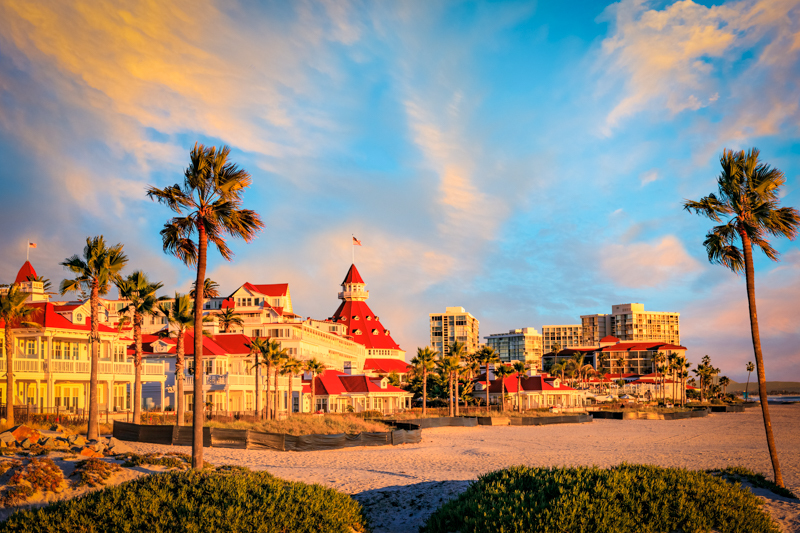 San Diego is home to numerous attractions including the San Diego Zoo and its Safari Park, Sea World, Torrey Pines State Natural Reserve, La Jolla Cove, Coronado Island and the San Diego Padres of Major League Baseball. You can plan to either use your car or rent a car to get around the city. If want to enjoy some adult activities, San Diego has a great craft beer scene with multiple pubs and restaurants throughout the city. You can try some of the best brews in a region known for producing the best American beers. The Del Mar Racetrack is also a great getaway for mom and dad with races held Wednesday through Sunday from mid-July through early-September. Friday night races usually feature a free concert as well. Single-day passes are available for the zoo, safari park and Sea World—but seven-day passes give you admission to all three. At a price of $120 for kids ages 3 to 9 and about $150 for ages 10 and older, these give you the most value out of your trip. As with most destinations, hotels closest to common tourist spots are more expensive. While downtown is a great place to stay, also explore options that are centrally located to everywhere you want to visit. Disney World is truly the most magical place on Earth, and it’s in a city that also offers a variety of activities for mom and dad. Choose from four theme parks, two water parks, 24 themed resorts, and 42,000 acres of fun allowing the kids to be kids and even adults to be kids all over again. There are plenty of options for creating the perfect getaway to Walt Disney World, from a trip lasting a long weekend with time for one or two parks or a weeklong stay allowing you to visit a different park each day. Parents who want some time on their own can arrange for in-room child care if they’re staying at one of the Disney Resort properties, or you can drop them off at one of the children’s activity centers. Numerous restaurants and shows, such as Cirque de Soleil, are near most Disney properties. Because of the great weather year-round and the park’s constant growth, there aren’t many non-peak times of the year at Disney World. However, the end of August when most children head back to school can be a bit slower. Regardless of when you visit, search for dates offering free dining-plan days where kids and their parents eat free with select packages. Consider squeezing a trip in before the kids are back in school or flying out for a long weekend during a fall break. Simply put, Alaska is beautiful during the summer. Some will tell you that the only way to truly experience it is by a cruise. Voyage of the Glaciers Princess Cruise is a great option. During your trip, you’ll see a variety of wildlife with certain animals appearing more depending on the season. Bears are a common sight during June when spring has come to a close and summer begins, and whales can be spotted heading back south for fall and winter from August through September. All meals and entertainment are included in the price of your package. The ship has youth lounges, teen centers and an adults-only pool deck called the Sanctuary offering lunch and personal massage services. The cruise is one-way and starts in either Anchorage ending in Vancouver, or Vancouver ending in Anchorage, depending on your preference. Book your airfare through the cruise line to get the best deals. Booking through the cruise line also guarantees that if your flight is canceled, you’ll receive complimentary transportation from the airport to the ship. Rooms on the ship run about $300 per person for seven days on the water in one of the ship’s interior staterooms, which sleep up to four people. The Caribou Highlands Lodge, in Lutsen, Minnesota, is the perfect place for all-around active families. Hiking, kayaking, canoeing, beautiful views of nearby Lake Superior and mild weather in the afternoons are all benefits of a summer trip to this getaway tucked in the heart of the Great Lakes. Evenings get cool enough, in the low 50s, to dress in a couple layers, but they’re still comfortable enough to enjoy s’mores around the campfire with the kids. The nearest airport is Duluth International, so plan on renting a car to make the hour and 45 minute drive up the Superior shoreline to get to the resort. Several towns well-known for their fish shacks and art galleries also line the shore on your drive to the lodge, so take a little bit of time on your drive up to experience them on your trip. Standard lodge rooms at Caribou Highlands start around $120 per night during the summer. Permits cost $7 per day for each car parked on the property, and you can even purchase a year-long permit for $25 if you plan on visiting during other seasons, including the ski resort on the property during winter. These six summer getaways are great ways to experience a great vacation with your family. While you’re traveling, keep in mind that Ambit Energy also offers its Customers opportunities to earn other great travel rewards. That’s right, you’re already earning points just for being a Customer! You earn points through kilowatt hour (kWh) usage in your own home and/or by referring others to Ambit and closing on five new enrollments lasting 60 days. Learn more about Ambit Energy’s Travel Rewards on our website.